Every month, The Indypendent’s advice columnist, Rev. Billy Talen, tackles the mental and spiritual quagmires of the Trump era. Dear Rev, Sometimes I wake up and feel like the whole ship is sinking. Then I get the music, drink some coffee, light one up and things are okay. But I can’t shake the feeling for long. Later, I’ll be walking along and see, on some barroom TV, people trapped in a flood or something and I get the blues. Ray, you are not alone. I can’t remember the last time when so many of us were so haunted. One thing is clear: the force of normal living in consumer society is much stronger than anybody expected. The fierceness we put into another day. We march to the train, walk down the street, ride up and down the elevator and every couple hours we do a big double take at how completely inappropriate it all is. We’re just inches away from the horror. We’ll be staring into a fire or flood on a screen somewhere and then, and then… Normalcy catches us, sneaks up from behind and engulfs us. The ads, headphones, sirens, gas smells — it closes over us and takes us back. We’re not allowed to experience this thing that looks a lot like the end of the world. Hi Billy, I saw an event listing on Facebook for an immigrant rights rally at Federal Plaza the other day. Demonstrators were asked to bring one item that they would pack in their suitcase if they were being deported. I couldn’t make the rally (I had to work), but it got me thinking about priorities. I own so much junk! I saw online that you were at the protest. How did you decide what to bring? I packed the wing of an owl for my partner, Savitri. And poems by Rene Char. The force of this movement is that it reminds us all of love. Emma Goldman said, “Love is the molder of destiny. Love is stronger than laws.” What are the small sacred objects you give your loved ones at the point that she or he is taken from you? One of the things in the suitcase is revolution. Reverend Billy is an activist and political shouter, a post-religious preacher of the streets and bank lobbies. Got a question for Reverend Billy? Just email RevBilly@Indypendent.org and unburden your soul. 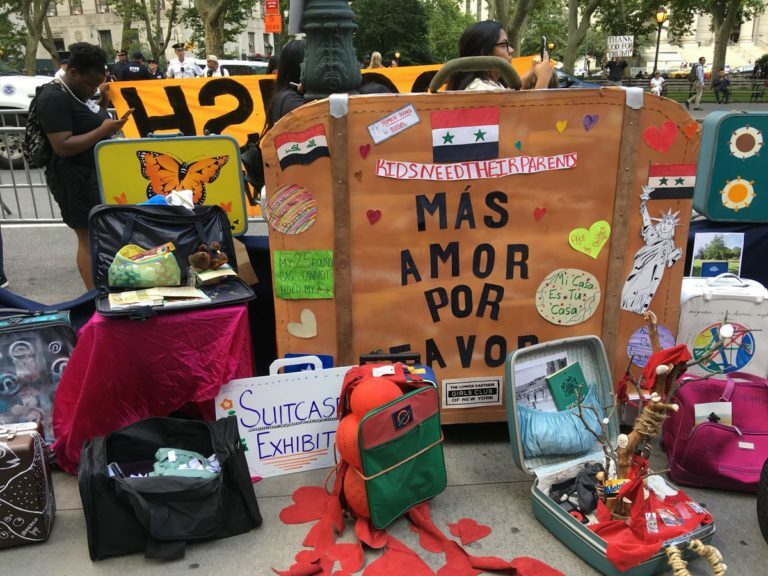 Photo: Items brought to a Deportee Suitcase Solidarity march in Lower Manhattan on July 26. Credit: @bkindivisible/Twitter.